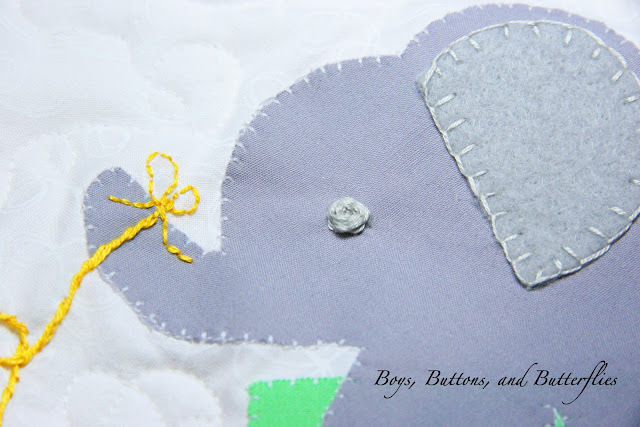 I decided it was the best technique for the elephant on Baby William's quilt. (FULL quilts HERE). And since I had a few questions about it, I thought I'd share the technique with anyone interested. The foundation for this is a bunch of straight stitches. They look like spokes of a wheel. I liked five for the eye which when it is finished is approx. 3-4 mm diameter. Note: The larger your design the more number of spokes you will need. 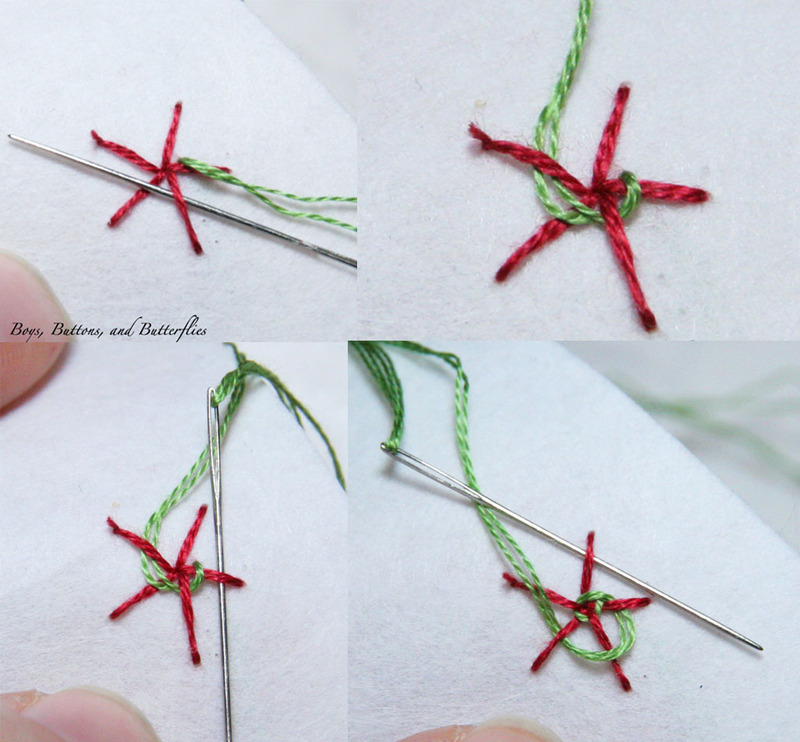 Make your straight stitches come to the same center point. 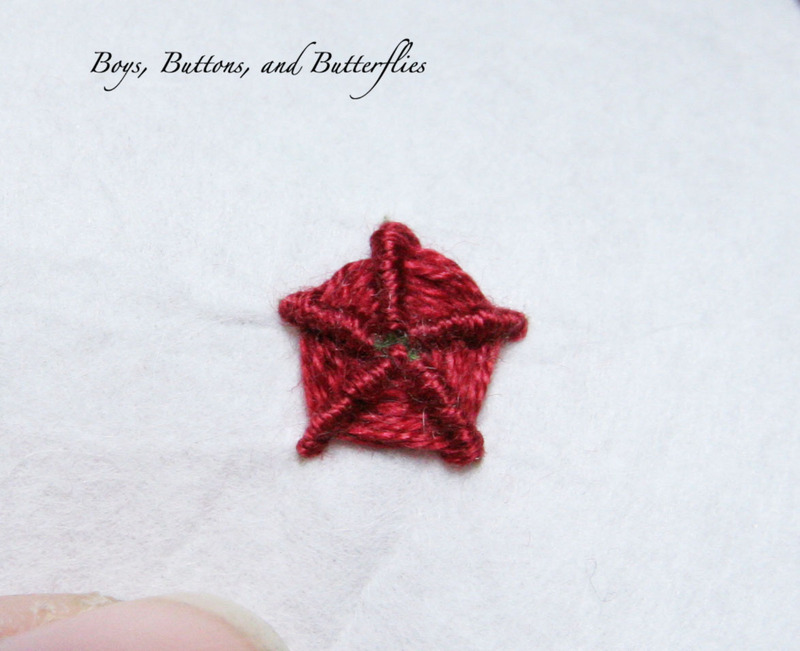 I used a second color just for instructional purposes, but you will use the same thread you started with to make the spokes! 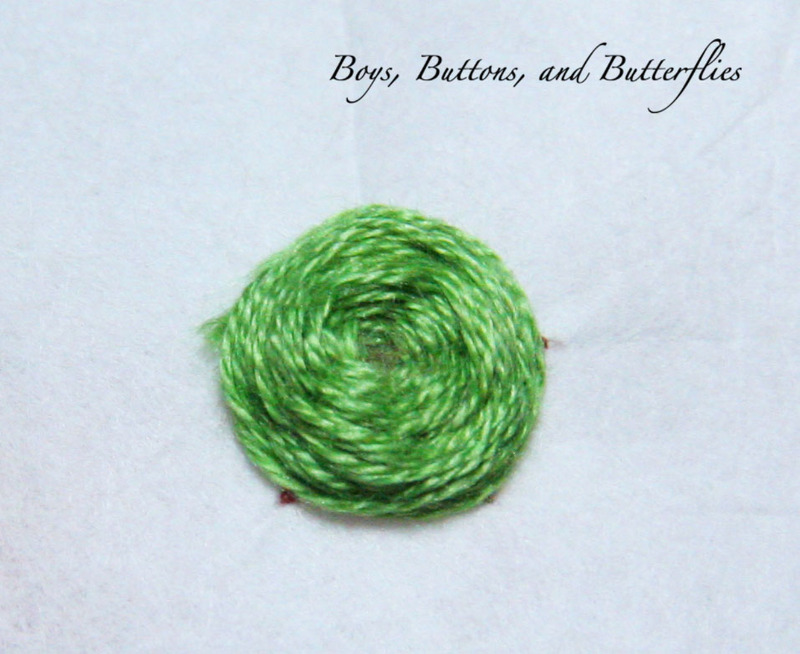 You will start weaving the embroidery floss/thread over and under each spoke. Pull the stitches snugly towards the center. Keep going over and under, over and under. It will keep building like this. You will keep weaving until all the spokes are completely covered. It will look different depending on how loose or compact you pulled your thread. 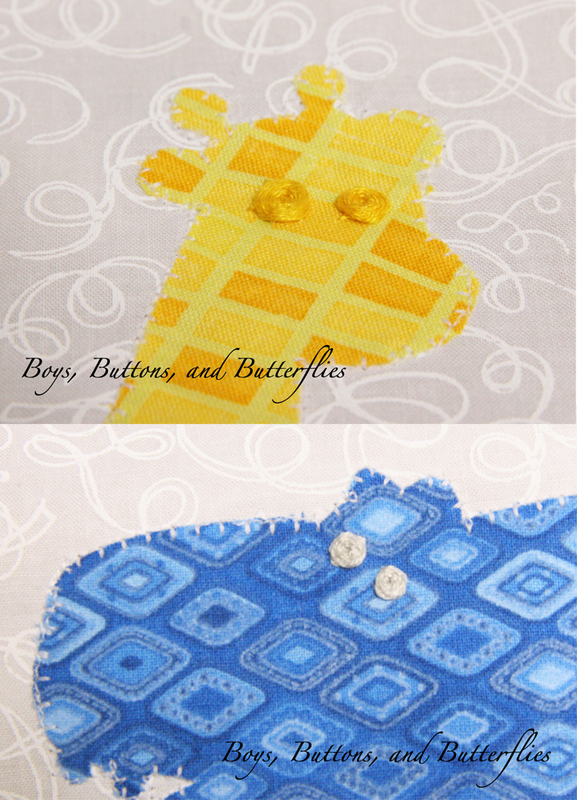 Options: Any type of thread, yarn, or ribbon! Uses: Flowers, wheels, circles, and dots. Guess what? It starts out the SAME way as the Woven Spider Web. The only difference is that you can do odd or even amount of spokes. For the purpose of this tutorial, I just did five spokes. This happens to be a bit more tricky, so I labeled each spoke with a number. To begin with, you will see that above you will go UNDER two spokes (1 and 2). then UNDER the next two spokes (2 and 3). 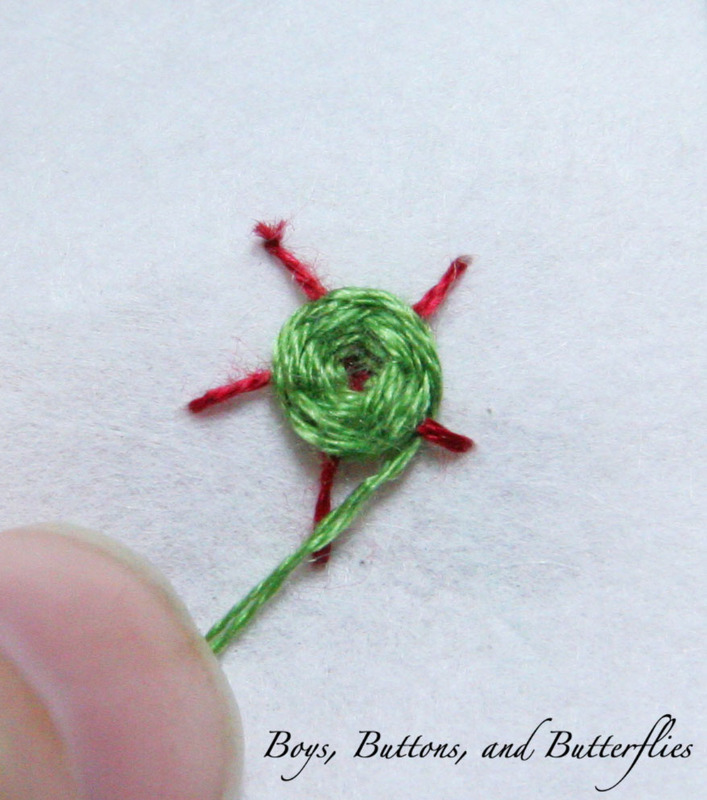 The embroidery floss SHOULD be wrapped around spoke 2 (see arrow above). After you have gone UNDER spoke 2 and 3, you will "backstitch" over spoke 3. Under spoke 3 and 4. Backstitch over spoke 4. Under spoke 4 and 5. Backstitch over spoke 5. After a few rotations, you will start to see that each spoke will be covered and a nice spider web look in between each spoke. And like the woven web, you will continue until all of your spokes are completely covered. Uses: I contemplated this, but didn't really like it for eyes. I think it would be better suited for flowers, spider webs, wheels, and of course circles and dots! Just a reminder, I used two different colors for instructional purposes, but you should use the same thread throughout! And if you are wondering, I strictly use embroidery floss, and usually just use the basic DMC brand you can pick up from your local hobby/fabric store! I have used it for 14 years now, and it hasn't ever bothered me! Feel free to ask any questions! Hope this was helpful! Oh no! you have given me an idea...do I really want to make 80+ of these??? I wondered how you did the giraffe eyes last post. I love them. Thanks for sharing how you did it. I never thought to use that stitch for eyes. Great idea! The animals came out so cute!